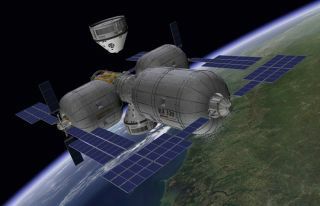 This artist's concept depicts a Boeing CST-100 spacecraft approaching a private inflatable space station designed by Bigelow Aerospace. SAN JOSE, California — There are strong prospects that commercial space stations will become a reality within the next 10 years if entrepreneurs and NASA can properly manage the tricky transition from the government-run International Space Station to privately built and operated facilities, experts say. "This is an exciting moment," said Alex MacDonald, program executive for NASA's Emerging Space Office. "We are going to have a legitimate opportunity to run that great experiment of privately owned facilities, if you guys are able to raise the money to do it. And that's really the exciting part." NASA uses the International Space Station (ISS) for basic research and to reduce the human and technological risks of sending astronauts beyond low-Earth orbit (LEO). That need will not end even if the space station is retired in 2024, as currently planned, experts say. "NASA will continue to need an environment in which it buys down those risks to a certain point," said Mary Lynne Dittmar, CEO of Dittmar Associates. "The question is, what's that point? Where do you get to the point where you say, 'OK, I've retired enough risk, or I've got risk down to the point where I can't really fix it all, but I can identify it and then make decisions about how I'm going to manage it or how I'm going to respond to it?'" Dittmar added. "That question continues to be one that is debated inside the agency, and sort of moves back and forth inside the agency. I would say that the window is narrowing on it, but it's not set." NASA will not build another space station in LEO; instead, it will look to buy services from the private sector. "From a commercial point of view, the issue is, how do you know when you're there there?" Dittmar said, then supplied the answer herself: "When you know that you have a critical mass of investment and endeavor and applications being developed and new ideas and entrepreneurial avenues and all the rest of that." Private companies are currently using the ISS for experiments, commercial research and the launching of tiny spacecraft called cubesats. Marybeth Edeen, NASA's ISS National Laboratory manager, said that crew time for conducting experiments and deploying cubesats is at a premium. As soon as private industry starts to create platforms for such activities as gowing protein crystals, launching cubesats or conducting rodent research, NASA will offload those activities to free up time and space for other work, Edeen said. NASA will not become an anchor tenant for a commercial facility, she added. Jeffrey Manber, managing director of NanoRacks, a company that helps send experiments and satellites to the ISS, said there's a need for more destinations in space as transportation options expand in the years ahead. "We know that, let's say in five years, you'll have five ways to send humans to and from space," Manber said. "That's pretty extraordinary. You're going to have Boeing, you're going to have SpaceX, you're going to have Roscosmos [the Russian space agency], you're going to have the Chinese, you'll be looking at Blue [Origin] in a few years. You know, it's just an extraordinary time when you just look at the range of opportunities. "We need destinations," Manber added. "For me, in an ironic way or a convoluted way, the importance of deploying small satellites from the station today is that it makes platforms relevant today. It makes destinations [relevant]. I don't want to be in a world where we're just launching rockets, sending off satellites. I want to be in a place where, in the near future, we're living and working in space."